Japanese Episode DP 151: "Agnome, Yuxie, and Emrit!" American Episode 1246: "The Needs of the Three!" Satoshi, Hikari, and Takeshi are all sleeping one night when they each have a dream about the lake trio. When they wake up, they wonder if what Jupiter had said about them being the chosen ones is correct. Meanwhile, at Lake Risshi, Pokemon Hunter J sets out to catch Agnome. She drops the Galaxy Bomb, a special bomb made with the energy collected from the Tobari ruins, and creates a hole in space through which Agnome emerges. After J captures the first pokemon, the other two teleport to Lake Risshi in an attempt to restore the balance that Agnome's capture disrupted. Yuxie and Emrit both use Future Sight on their opponent, but the Pokemon Hunter ignores their attacks and captures them anyway. J delivers the three pokemon to the Ginga-Dan administrators who had been waiting for her below and then takes off in her airship. Suddenly, the Future Sight attacks hit, causing J's ship to plunge into the lake and explode! Saturn and the others ignore their employee's apparent death and take the trio to their hideout. There, the Ginga-Dan introduce the Red Chain to the pokemon, causing them to wake up. They use this moment to teleport Satoshi, Hikari, and Takeshi to the base. Once our heroes get their bearings, they realize that Akagi, the man they had met at Kannagi Town, is the leader of the Ginga-Dan! Satoshi and his friends prepare to battle Saturn, Mars, and Jupiter in an all-out battle to stop the Ginga-Dan and save the Shin'ou Region. Can they succeed? To be continued! Sometimes, when I do an episode comparison, it feels like it takes forever to get through an episode. Some of the stories this show tells are an absolute chore to sit through, and I often find myself glancing at the clock to see how much longer I have to put up with this junk. This episode, however, was not like that at all. I was completely engrossed with this thing from start to finish, and the hour I take to watch these episode (thirty minutes of the Japanese version by itself, and then thirty minutes with the dub while I have the Japanese version on mute synched up beside it) just flew by. I remember seeing the episode's eyecatch and being surprised because I honestly felt like I had only just started watching. The episode is that good. For me, part of what makes this episode great is how it focuses on characters other than Satoshi and his pals. After the title screen, the pokemon trainers barely play any role in the story until J's death, and I really like that. By focusing on everyone else for a change, we get to see that there is, indeed, a world outside that of a trio of young kids and that the events that take place at Lake Risshi actually have an effect on the entire region. The show really never shows us anything of this scale, and I, for one, love it. And then there's J's death. I remember watching this episode when it first premiered in Japan and being absolutely shocked at the fact that this show that had long since been sanitized by a desire to appeal to an international audience would actually kill off a major character. Not just J, either; all of her henchmen and all of their pokemon are gone, too. People are trying to argue that she didn't necessarily die, but as far as I'm concerned, she's dead until proven otherwise. I do feel like that shot of the ship plunging into the bottom of the lake - it's the same shot where we see J's visor float up - drags on a bit, though. I almost feel like the animators are like "dammit, we spent all this money creating this 3D model for her ship, and we're sure as hell are gonna get our money's worth!" The English version continues to keep all the Japanese music except for the title screen music, and that's just great. This is actually the first time since the Riolu two-parter where we've had two episodes, back to back, keep this much of the Japanese music. Do we dare get our hopes up and expect the next episode to keep its Japanese music intact as well??? There isn't that much going on in this episode, so this will be brief. The dub, on the other hand, just has Ash read it, like always. 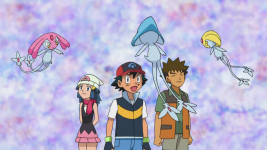 In the second half of the episode, Shirona, and then Pluto a little bit later, both refer to the three lake pokemon with that stock phrase that everyone uses to refer to every legendary pokemon ever, "the pokemon known as gods." In the dub, Cynthia calls them "legendary" while Charon calls them "the core substance of the universe."